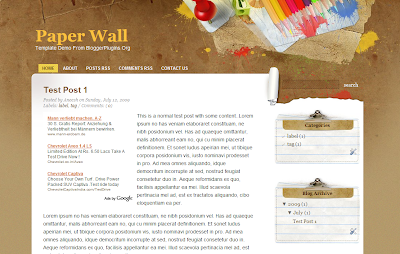 Paper Wall is an amazing Blogger Template that has a very stylish but simple design.. The Template was designed by Indeziner for Smashing Magazine and converted to Blogger by Deluxe Templates.. This Template is Adsense Ready and comes with these features modded onto it.. 1) Integrated Blended Adsense Ads..
2. Now create your website profile. 3. In google analytics home page all of your sites will be displayed..
5. This is the Tracking code for analytics..
how can i remove the 'about' and rss on the top?? I couldnt download this template for my blog aneesh? Kindly help. System error: -2146697204. Error processing resource 'http://www.w3.org/TR/xhtml1/DTD/xhtml1-strict.dtd'. the XML template should be opened from some text editor like notepad or wordpad.. This wont be displayed on Browsers.. Or you can just upload the xml file in your edit Html page..
hi Vijitha, i didn't get you.. can you please explain? When I uploaded your HTML, it didnt fit my header wording, everything went out of place. If you could write a HTML to convert my blog to the one example I have given you, it would be great. Kindly quote me a rate. We can discuss your rates. If its fine with me, we can proceed changing my blog look with your help. Thanks! after copy than need to paste at whr ne? There you will see an upload option.. Just upload the tenplate that you have downloaded.. If you are still having troubles,do let me know and i will surely try to help you.. I was wondering if you have any info regarding publishing this template on a self hosted blogger blog. I added the code to the template html editor within blogger several times and the end result does not render the template, only 1 image and the nav. I was really looking forward to using this template. @starsunflower if you are talikng about an FTP published blog,then you cant use this template.. You can use only old classic templates on FTP blogs..
hi..template is excellent..i just want to remove the..defualt searchbar..from the template...can any1 tell me how to remove it..
coz it doesnt work..when we want to search something..or can any1 tell me..how to make it work...coz i want to add search option in my blog..thnk u..
@Anonymous i can surely help you out.. just show me your blog url..
i solved tht prob..actually it was working tht..was my mistake..
& if i want to put the read more.. option in post how do i put it..coz..everytime...when i post it shows the whole post on the home page...plzz help me out!! i want content in middle..
& want to put other stuff around it..i.e.both left & right side..
but i cant do it..can any1 help me out!!.. hi..Still no reply for my query..:(..
well i've 1 more query..
i want to add more widgets at the bottom of my blog..
plzz help me how to do like this..help me..& guide me..
when you make another sidebar to the left,this theme will have to be totally changed,including the images..
the second thing that you asked is almost possible.. Adding widgets at the bottom.. I did not understand how to use "Paper Wall Blogger Template" Can u help me? yes sure.. did you download the template?? and there use the browse button and upload the paperwall template..
XML error message: The value of attribute "href" associated with an element type "null" must not contain the '<' character." Also, I used your suggestion for deleting the rss feed links at the top, but that disrupts the formatting for the posts, they are a bit higher, how can I shift them down a few pixels? Is there are way to erase the Rss feed links at the bottom as well? XML error message: The value of attribute "href" associated with an element type "null" must not contain the '<' character." mean? I copied directly from the word pad. I wonder if you could help me with getting the formatting correct after I deleted the RSS feed links. Also, is there a way to delete all of the RSS links at the bottom too? (essentially the only think I want after the post block is the copyright info. Thank you! Wonderful layout design! Quiero cambiar de plantilla y me aparece un error del sistema 2146697204. El recurso al error aprocesar, Porque no se me venta y que quiere decir. can u help me on how to acquire this template?